This is for general information that school wise posting/deployment of Asstt'Teachers (Lower Primary, Upper Primary-Social Science, Upper Primeary-Maths & Science) engaged on contractual basis under Sarba Siksha Abhiyan, Assam as per this office notification no SSA/ TT/Engagement of A.T-2017110951201712966 dated 01.09.2017 has been notified & published on 6th September,2017. 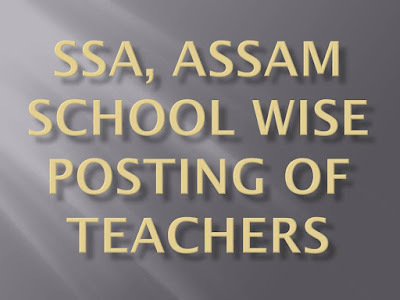 Please read this article till the end to know how to download school-wise posting/deployment from the SSA Official Website (www.ssaassam.gov.in). OfficialWebsite (www.ssaassam.gov.in) at 11 AM on 6th September,2017. You will find the following on the page of SSA, Assam website. School Wise Posting/Deployment of Lower Primary Asstt. Teacher Engaged on Contractual basis under SSA, Assam. School Wise Posting/Deployment of Upper Primary(Maths & Science) Asstt. Teacher Engaged on Contractual basis under SSA, Assam. School Wise Posting/Deployment of Upper Primary(Social Science) Asstt. Teacher Engaged on Contractual basis under SSA, Assam. The teachers concerned are requested to join in the respective school and to execute the agreement with the respective School Management Committee immediately. Further, they are requested to register in the NIOS portal for D. El. Ed. Course in ODL mode on or before 11th September,2O17 to acquire professional qualification, if not acquired as per NCTE norms. lt is to be informed that non-enrolling in NIOS portal within stipulated time or non-completion of the course within March,2019 will invite dismissal of their service as notified in the State Government notification no. AEE296I2O17/6 dated 1st September,2017 . The posting is done considering requirement of teachers in the school of respective districts. The authority reserves right to transfer/rationalize the posts/teachers to any elementary school of the state as per requirement at any point of time. Click here to download District-wise and School-wise Result of TET Teachers.